The Plant Provocateur - Hot Houseplants Flowers Gifts - Silverlake Los Angeles - Veins Of Ice So Very Nice! Veins Of Ice So Very Nice! The venation in this foliage is so beautiful I can't stand it! We're talking high fashion flora here. It always amazes me when nature punches up the patterns to create something so spellbinding and so bold. Here we have a case of a plant that in its other forms I find rather, well, regular. The genus is Forsythia. Forsythia remind me of early spring growing up in Michigan. 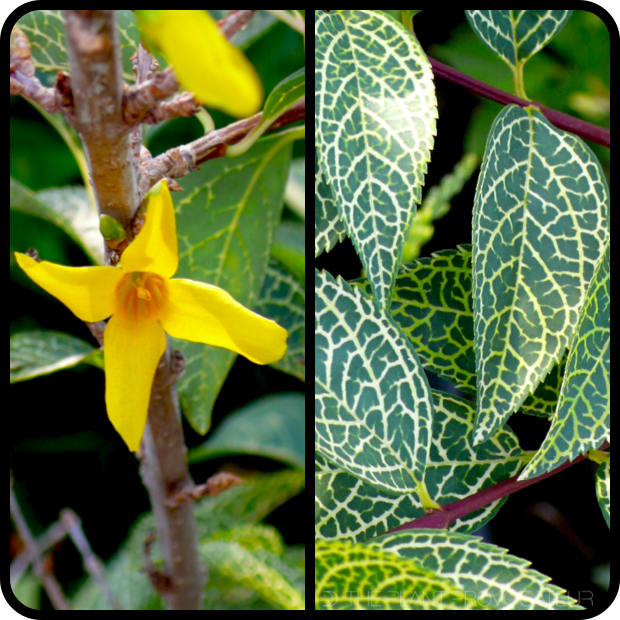 Do you know Forsythia? It's one of the first shrubs to bloom come early spring. Late winter/early spring Forsythias, which are deciduous and generally leafless in the winter months, produce bright yellow blossoms on old growth branches. You usually see them in flower arrangements in restaurants and shops in early spring heralding the coming of a new season. For most Forsythias... that's all they've got to show. But then there's Forsythia viridissima koreana 'Kumson' sometimes labeled as Forsythia koreana 'Kumson'. It's a multifaceted shrub both in leaf and out. In spring and summer, it outfits itself in fine fashion with a variety of frosty white vein-patterned foliage. The look is dizzyingly delicious! New growth stems are richly regal in purple color. Come winter, as the foliage falls, bold, bright yellow flower buds form and unfurl their sunshine superblast of color for the early spring thaw. We're talkin' some seriously stylish seasonal interest here. So how can you grow such grooviness? Well, give it part shade, well-draining soil (it can handle a wide variety of types), and regular water. It can become drought tolerant once established. It also can tolerate living in lands where the temps fall as far as 15 degrees to -20 degrees below fahrenheit/-28 to -9 celsius, in winter. Grow it as a foundation plant or screen. It can get 5 feet tall and wide. So if you're into putting some sophisticated profile into your style check out Forsythia viridissima koreana 'Kumson'. It'll give you that woodsy wilderness wonderland vibe!